Today I am back to my normal, enthusiastic, energetic self; considering my last two posts were quite distressing. I’ve noticed, so you must have. Today was very cold. 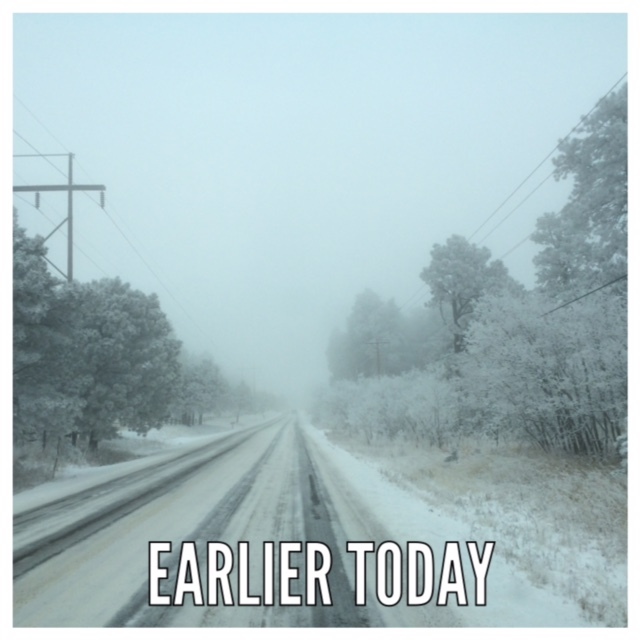 January is the coldest month of winter in Colorado, so going to and fro from place to place can be hard. I had a piano lesson earlier today, and you could feel the traction on our car’s tires. The peaceful part reminds me of Narnia, and the blizzard part reminds me of the Mountains of Moria. There’s a certain peace that comes from snow. Tonight, as we drove my little sister to dance class, we could hardly see where we were going because of all the fog! 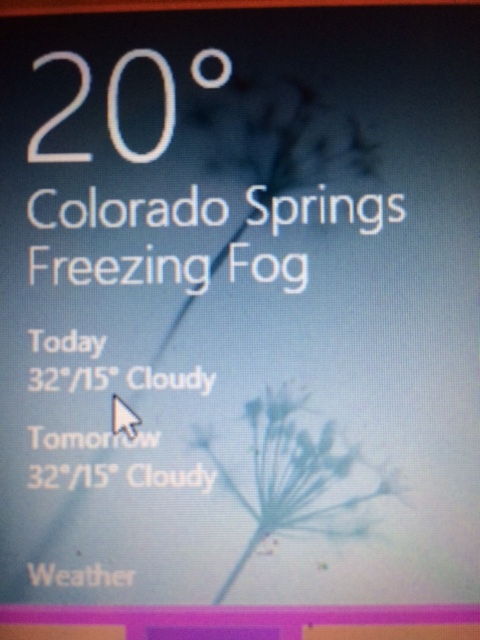 Have you ever heard of freezing fog? I was brave enough to roll down my window and let the cold mountain air slap my face (in a good way). I thought about a lot of things as I looked out the window; My new horse, whether or not we would get to Joann’s and still get back on time to pick up Ally from ballet, and the fond memory when my Dad and I went to go see the Hobbit on December 17th. As I let the cold wind rumple my hair, I felt a sense of gratitude, and felt peace. The only peace you can feel on a cold, quiet, Rocky Mountain day. I felt like it was meant for me, and and that I was chosen to enjoy the moment. Feel the wind, touch the chilly frost, breathe the mountain air, live the dream. In fact, I felt like it was a dream; but it was not. Was it over? No. In fact, It was just the complete opposite; the beginning of a grand adventure; cause isn’t that what life is? A big adventure? We walk the road and live the life, never knowing when it’ll turn for the best, or the worst. But, just for a moment, let’s not think of it that way; let’s think of it as not knowing what will go wrong, but what unexpected blessing the Father will pour on us. Something as simple as feeling the wind in your hair on a chilly winter day, to owning a beautiful Palomino named Sunny. We as humans are 99% of the time pessimists; not optimists. I am currently training to participate in The Royal Conservatory Music Development Program in May, and I have a lot of study and practicing to do! My piano instructor – Mrs. Susie – told me that I’ll work on sight reading with hands together, and my heart sank. “Oh, I am so not good at sight reading!” I exclaimed. Mrs. Susie looked at me and said,”No, you are good at that; and I don’t ever want to hear you say that again, so say it as much as you want right now to get it out of your system! Because you can do it!” I felt a bit lighter, and looked on the bright side, I’ve got parents who believe in me, a piano instructor that gives me great instruction and two cheerleaders of siblings on my side (soon to be three), and I’ve got Christ. The Lord wants to bless you and that’s a fact. Maybe you’re the kind of person who always says,”Oh! I couldn’t!” Well, this is for you (and everyone else): God will bless you because He loves you and there is nothing you can do about it! I hope that’s good news, so look on the bright side. While we’re on The Road, sure, there will be ups and downs, highs and lows, but to see the Rainbow, you’ve got to wait out the storm (pretty good, huh)! So, blessings come in all shapes and sizes; from crawling on your hands and knees looking for led with your two year old brother (that he dumped on the floor) to replace your very special math mechanical pencil, to shopping for Gap jeans with my beautiful mom. Enjoy yourself, live for Jesus, bless other peeps (lol, Tina 🙂 ) like He blessed you! “Good morning!” said Bilbo, and he meant it. The sun was shining, and the grass was very green. But Gandalf looked at him from under His long bushy eyebrows that stuck out further than the brim of his shady hat. “What do you mean?” he said. “Do you wish me a good morning, or mean that it is a morning whether I want it or not; or that you feel good on this morning; or that it is a morning to be good on?” “All of them at once,”said Bilbo. Then he sat down on a seat by his door, crossed his legs, and blew out a beautiful gray ring of smoke that sailed up into the air without breaking and floated away over the Hill. “Very pretty!” said Gandalf. “But I have no time to blow smoke rings this morning. I am looking for someone in which to share in an adventure that I am arranging, and it’s very difficult to find anyone…” “Sorry! I don’t want any adventures, thank you. Not today. Good morning! But please come to tea – anytime you like! Why not tomorrow? Come tomorrow! Good bye!” With that, the hobbit turned and scuttled inside his round green door and shut it quickly as he dared, not to seem rude. Wizards after all are wizards. “What on earth did I ask him to tea for!” he said to himself, as he went to the pantry.